The ability for sawmillers to rapidly grade and segregate timber creates huge savings in wood processing costs. Grading technology developed jointly by Scion and Taranaki-based firm Falcon Engineering has proven its worth in New Zealand sawmills and is now being noticed in North America. The A-grader is a stress grading machine that uses sound waves to measure timber stiffness at production speeds. 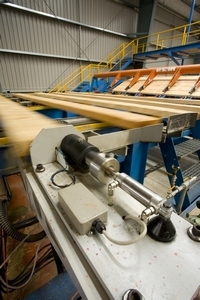 This information allows sawmillers to sort timber prior to further processing. Since the first A-grader was installed commercially five years ago, by Red Stag in Rotorua, most other major sawmills in New Zealand have adopted the technology. Saturation of the local market soon prompted Falcon Engineering to think global. An important hurdle was cleared recently when the A-grader became certified by Canadian authorities as an approved method for grading structural lumber in their country. This certification opens the door to a large and promising market. Falcon Engineering is entering this new market with an improved A-grader version. Project manager, Les Wong, says the 2011 version has been upgraded specifically for North American sawmills, which have higher speeds and greater volumes than New Zealand mills. Falcon Engineering has already sold the A-grader to manufacturers in the United States, and word is getting around about the improved grading efficiency that can be achieved with this technology compared to traditional mechanical graders. Falcon Engineering sees greater potential in Canada where there are a high number of mills and large capital expenditure budgets. Meanwhile, Scion and Falcon Engineering continue to develop the A-grader, and trials are now being conducted on technology that includes the ability to measure stiffness more accurately along the entire length of a sawn board. Scion Chief Executive Dr Warren Parker says the ongoing success of the A-grader demonstrates how local innovations in machinery development can improve the profitability of domestic wood processors. They can also find lucrative markets overseas, earning valuable export revenue for the country. “This example illustrates a spin-off benefit from the New Zealand forest industry that extends well beyond traditional forest products,” he says. Scion developed the original A-grader with funding from New Zealand’s former Foundation of Research, Science and Technology. Falcon Engineering received a Technology for Business Grant to assist them with commercialising the machine.